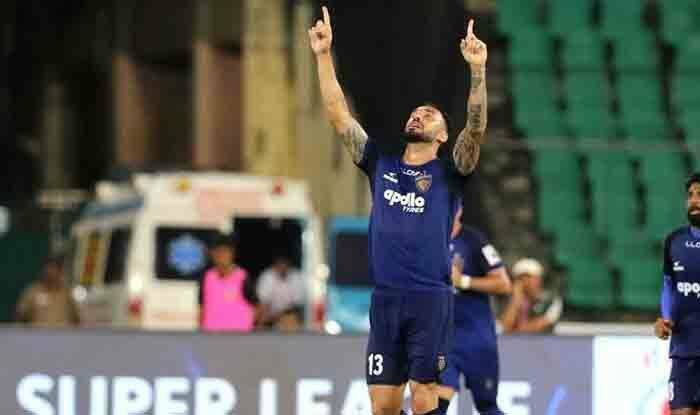 Chennaiyin FC overcame their lowly display in the ISL to outclass ISL counterparts Mumbai City FC as they qualified to the quarterfinals of the Super Cup. After what was a season to forget in the ISL, Chennaiyin FC overcame their lowly displays with a gritty performance against the Mumbai City FC, defeating them 2-0 to qualify to the quarterfinals of the Hero Super Cup at the Kalinga Stadium in Bhubaneshwar on Friday. Goalscorers on the evening were CK Vineeth, who opened the scoring with a stunning long-distance effort at the brink of the first half which was further capitalised by Manipur’s Jeje Lalepkhlua in a well-worked goal. Mumbai City were toothless in attack as they failed to break down Chennaiyin’s defence. The match started on a cagey note with both sides battling it out in the midfield with Raynier Fernandes of Mumbai City and Isaac Vanmalsawma of Chennaiyin causing the most danger with their pace and trickery. The Islanders failed to muster up any clear opportunities in the half, with Raynier Fernandes’ long-range shot testing the palms of Karnajit Singh. Just when it looked like the half would end goalless, Vineeth opened the scoring with a sumptuous finish. The 30-year-old found space outside the penalty box, turned and then fired a shot, which flew into the top corner. Only a minute later, Jeje doubled Chennaiyin’s lead with another neat finish. This time the Mizo sniper got on the end of a well-placed cross from Thoi Singh, before efficiently guiding the ball into the top corner, leaving the goalkeeper with no chance. With that, the Marina Machans entered the half with a healthy two goal lead. John Gregory’s unit were riding high on confidence with the lead and nearly scored a third within minutes of the second period. Vineeth again threatened the Mumbai defenders with his clever movement. He managed to find a few yards of space from 25-yard-out before unleashing a fierce drive, which forced Ravi Kumar into a fine save. Mumbai continued to struggle in the second half, failing to break down Chennaiyin’s resolute defence. Goian came closest to pulling a goal back for Mumbai when his long-range attempt nearly creeped into the far post. That proved to be the only notable attempt for Mumbai as the likes of Mailson Alves and Eli Sabia held their fort well to ensure that the South-Indian team finished with a clean sheet.